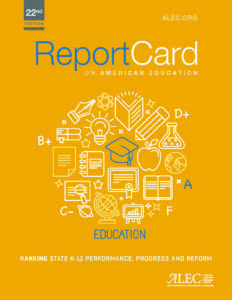 The education policy grade on each state’s Report Card is based on six factors: state academic standards, char- ter schools, homeschool regulation burden, private school choice, teacher quality, and digital learning. Because the Ed- ucation and Workforce Task Force at ALEC focuses the most on private school choice and charter schools, those factors were given double weight in the calculation over overall rank and grade. The weighted grades were converted into a GPA average and an individual rank. Ties were broken by states’ private school choice grades, followed by grades in charter schools and finally, grades in digital learning. States with school choice or charter laws that earned Fs still benefited from having them in ties with states that do not have any programs on the books. Some reports have not been updated in the last year, and some states did not report data in some of the categories. In these cases, the previous year’s grade was used. Without rigorous standards, high “proficiency” levels can mean little in terms of academic achievement. A state’s ac- ademic standards grade comes from an Education Next report, which measured the difference in the percentage of students considered proficient by the state exam and the percentage of students in that state who scored as proficient on NAEP. The charter school grade on the Report Card is based on a publication of the Center for Education Reform, which grades charter school laws across a series of factors. The Charter School Law Ranking and Scorecard takes into account features of a state’s charter law that influence how well charters are able to flourish, such as availability of independent authorizers, lack of growth caps, autonomous operation free from legal or regulatory red tape, and funding equity. The handful of states that have not yet passed a charter school law received Fs on their Report Cards. Almost two million students each year are homeschooled in the United States. ALEC supports homeschooling freedom and the right of parents to take direct control of their children’s educations. The policy grades in this category correspond to the Home School Legal Defense Association’s analysis of state laws, which categorizes the burdens states place on parents who wish to homeschool, from relatively-innocuous notice requirements, to high-regulatory environments that may make it difficult for parents who choose this form of education for their families. In 2016, integration of technology into the classroom is widespread and necessary, but some states have done a more efficient and effective job utilizing new technology than others. The Foundation for Excellence in Education puts out an annual Digital Learning Report Card,6 grading states on factors such as student eligibility and access, per- sonalized learning, and quality choices. The school choice ranking was compiled by the American Legislative Exchange Council. Any ranking purporting to compare the varied types of ed- ucational choice programs across the country, from edu- cation savings accounts, to vouchers, to tax credit schol- arships, must necessarily examine the programs from the 10,000-foot level. ALEC has chosen to address three main policy decisions that impact the success of any choice pro- gram: a program’s size and scope, purchasing power in the educational marketplace, and flexibility and freedom. Some states with long-standing school choice programs may be surprised to discover their lower scores, but af- ter more than two decades, it is time for the education- al choice movement to set its sights higher, and to aim for broad-based, useful, and successful programs. The most important aspect of any educational choice pro- gram is, of course, the number of students who are ulti- mately able to utilize it. The most heavily-weighted cate- gory of the school choice grade assigned by ALEC includes the number of students as a percentage of the state’s pub- lic school population, percentage of students eligible, and points for the breadth of a program. States lost points for restricting their choice programs to families with limited income, families within a certain geographical region, or families of children with special needs. All families deserve to be empowered to choose the best education for their children. The financial awards parents receive when they participate in educational choice programs can determine the options they have to choose from. A too-low award may help mid- dle-class families move a child to a private school, but will not provide those opportunities to a wider group of par- ents, especially in states that do not allow parents to “top up” tuition payments beyond the award amount. Funding too low to cover tuition costs is among the most-cited com- plaints from private schools that receive school choice stu- dents. While higher per-pupil spending has not produced better academic performance, a child should not receive lower funding merely because his or her parents chose to opt in to an educational choice program. Awards are mea- sured as a percentage of public school per-pupil spending in the state to take into account differing costs of living and relative public education spending levels, as well as appro- priately adjusted in programs that exclusively serve spe- cial-needs students, for whose education the state pays public schools two, three, or more times the average pub- lic expenditure. Regulatory burdens differ from program type to program type; it is difficult to compare regulations on scholar- ship-granting organizations in Florida’s tax credit program with regulations on Louisiana’s vouchers or Arizona’s educa- tion savings accounts. However, two factors serve as reason- able proxies: private school participation, which provides a rough measure of private-sector enthusiasm, presumably tied to regulatory barriers to entry, and state testing man- dates, which rank among private schools’ top concerns re- garding school choice program participation. Finally, states with ESA programs were given extra points, partially to offset the inappropriateness of the school par- ticipation metric to evaluate programs that are supposed to move beyond school choice to educational choice, offering parents the ability to completely customize their children’s educations beyond the classroom environment. Research has shown that ESAs generally impose the lowest regulato- ry burden on participating providers, followed by tax cred- it scholarship programs, with vouchers bringing up the rear. States with brand-new educational choice programs that have not begun enrollment yet can expect to see their num- bers jump substantially in the ranking as they are able to post student enrollment and private sector participation numbers. A few states do not report particular data points, and estimates or zero scores were awarded as necessary. The theme of this edition is the “underfunding myth,” ex- posing the lack of connection between funding increases and student performance. Each Report Card includes the change in per-pupil spending amounts from 2013 to 2015, and the corresponding years of NAEP results. States that made large increases in spending and actual- ly went backwards in academic performance assessments were awarded a “breaking the bank” icon. States that im- proved their NAEP performances while decreasing or hold- ing steady their per-pupil spending were awarded gold stars for their stewardship of hard-earned taxpayer dollars. Additionally, a funding breakdown, graduation rate and class size were included on the Report Card. None of this information factored into a state’s education policy grade, rank, or GPA, which were based only on that state’s educa- tion policies.